In today’s haircolor lesson I want to share with you 2-Ways that you can take a client back to a darker haircolor from a very light blonde (bleached or tinted) without it looking Green or some weird shade of funky gray. This procedure is commonly known as a Tint-Back! Use this Technique if you are still using a Blended Base Haircolor Line. A Tint-back is when you are taking a client that has been getting her hair bleached-out (as in a Double Process Blonde, Very Heavy Bleached Highlights or a Very Light Single Process Blonde with a high degree of porosity) back to her natural color or to any darker color than she presently is. 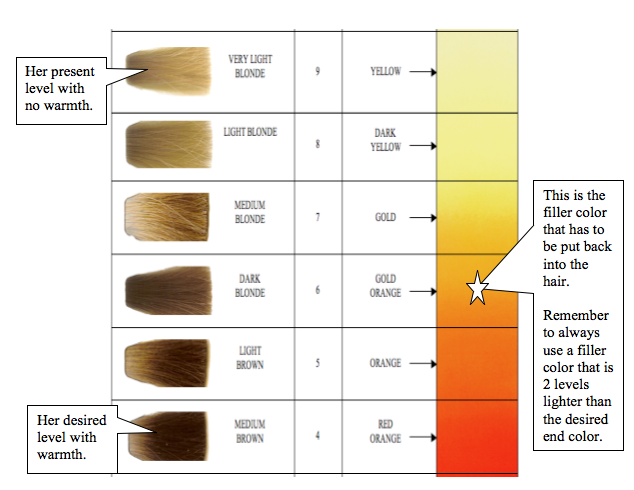 So in this case, we will use the contributing color pigment chart to see what colors have to be put back into the hair before achieving a natural looking finished result. (This technique is sometimes called “Color Packing” or replacing the “Building Blocks of Color”). The client has been double processed for some time now and wishes to go back to her natural color, which was a “Level 4 Medium Brown”. Now, remember, you cannot just select a light brown tint, put it on this bleached-out hair and expect to get a good color. There isn’t sufficient color base left in the hair to support the light brown color. The hair will grab the base of the tint in that blended base color and come out looking very drab, muddy or green. You must first put the missing contributing pigment back into the hair before you can apply the final desired shade. 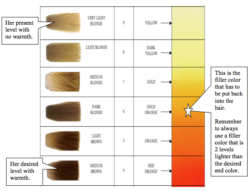 You can see by looking at the chart below that, in order to make a “Level 4 Medium Brown”, you will have to put back into the hair the missing contributing pigment, which is, in this case, “Red-Orange”. Back in the days of “Color Fillers”, we used to first put in the yellow (gold) filler and then put in the red filler in order to make orange. This is why it was called “The Building Blocks of Color”. However, today, all you have to do is select a demi-color shade that is “light orange” in order to give you the base needed (Tahitian Red Blonde works great). It is very important to use a shade that is at least two levels lighter than your final desired color so that the end result won’t look orange. 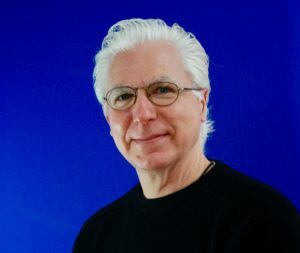 First, apply the light orange demi-color (mixed with the appropriate developer) to the entire head and allow to process for about 15 to 20 minutes. Then use a clean towel and wipe off the demi-color or rinse the demi-color out at the shampoo bowl. (It is not necessary to shampoo the hair at this point, just rinse with water). Next, mix and apply your final desired shade. I would suggest for your final desired shade continuing to use a demi-color. Since you are going darker and not needing any lifting action, a demi-color will hold better and keep the hair in better condition. Also, for your final desired shade, stay away from the neutral and ash shades. These may still result in drab and muddy looking hair. Instead, stick with the warmer gold or red shades for the best result. Let’s see how we can use this same information to do a tint-back on a client that wishes to go back to her natural color. A client comes into the salon with very light blonde hair that has been over-lightened and is very porous. The client tells you that she would like to go back to a more natural looking color that has a hint of red in it. You show her the swatch book and she points to 4Br Level 4 with a Red Brown Base. If her hair has plenty of gold still in it (like a warm brassy tone), you would probably be okay just using the tint that she chose. However, if the hair is very bleached out and lacks warmth, you must first fill the hair with a warm demi-color before applying the final tint. Let’s look at the chart below to find your starting point and let’s assume that she is about a level 9 with no warmth. If the client has any signs of ashen tones in her hair i.e. green, grayish or mauve, this color must be removed with a lightener before you do anything else. 2) Equalize the porosity of the hair shaft so that the color will look even from re-growth to ends. Now the big question is, what color (level & tone) should be used for this filler? The main rule to remember here is that the filler must be a warm shade because that is what is lacking in the hair. Always use a filler color 2 levels lighter than your desired finished shade. Remember, here you are only depositing haircolor, not lifting, so a demi-type color is what should be used. Now, let’s return to the chart. If you are starting with a level 9 and wanting to end up with a level 4, you should use a filler that is a level 6 (2 Levels lighter) with a “Gold-Orange” base, just like the chart shows. Go to your demi-color swatch book and find a level 6 shade that has a good gold – orange base and apply that color, re-growth to ends, for about 15 -20 minutes. Then wipe off the demi- tint with a towel and apply your level 4 (desired shade) right over everything, keeping a close eye on the development time. For your final shade, I would recommend also using a demi-type color because you are still only depositing and not lifting any color. However, if you want to use one of your permanent colors, I would recommend dropping down the developer to about a 10 volume as opposed to 20 volume. 10 Volume Developer for 20 Min. Because of Chromastics Pure-Base Color You will always get what you expect. Not some Weird Shade of Green or Gray! Click Here and Read This “Haircolor Review”!